If you need to carry any significant amount of stuff around, a backpack is the way to do it. Compared to a briefcase, messenger, or duffle, a backpack is more comfortable to wear, better for your back, and can likely carry more stuff around. The only problem with most backpacks is that they look like they belong in the gym, on a hiking trail, or roaming the halls of a high school. They certainly don’t look professional. That’s where Waterfield Design’s $349 Pro Executive Laptop Backpack comes in. This awkwardly named backpack is designed specifically for the commuter that needs to bring a fair amount of items to the office every day and wants something that looks as professional as the rest of their wardrobe. It has a clean, understated design that incorporates both high-quality nylon material with real leather accents available in four different colors. 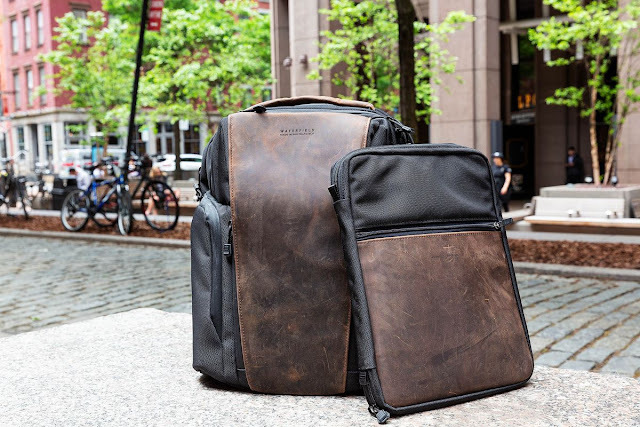 Alongside the Pro Executive Laptop Backpack is an optional $89 Executive Folio, which can hold a laptop or notepad and a few accessories. The Folio is made from the same materials as the backpack and can be color matched to the leather accents. It slots in the back of the bag, in the rear laptop compartment. I haven’t found the Folio to be very useful for my needs and I think it’s probably not worth the $89 for most people. I’ve been using the Pro Executive Laptop Backpack every day this summer, for both my daily commute to the office and on a couple of longer travel trips. It’s a near perfect commuting bag, with plenty of room for a laptop, tablet, charger, camera, headphones, accessories, and whatever else you need to carry around every day. It’s also very comfortable to wear, even on the sweltering summer days we’ve had in New York City this year, thanks to the breathable mesh padding on the straps and the back panel. The straps appear to be rather thin, but I’ve found them to be comfortable and supportive even when I’ve got the bag fully loaded with gear. One of my favorite parts of this backpack is its ability to stand up on its own, so I don’t have to worry about picking it back up every time it tumbles over, as I’ve experienced with many other backpacks. The Pro Executive Laptop Backpack has a couple of side pockets for accessories like pens, keys, USB batteries, phones, business cards, and other small items, but it doesn’t have any outside or waterproof pouches for a wet umbrella or sweaty water bottle. You can fit a bottle or small umbrella in the side pouches, but they will get whatever items you have stored in there wet, so it’s not an ideal solution. Those side pouches are the only ones on the bag that are ideal for organizing small items, so there isn’t really a great place to move that stuff to if you want to put a wet umbrella or bottle in them. The lack of a water bottle / umbrella pouch is really my only complaint with the bag, but there are numerous upsides. The pockets are roomy, the bag is lightweight and comfortable, the zippers are logically arranged and sturdy, and the design works with jeans and a t-shirt or a button down and a blazer. The Pro Executive Laptop Backpack certainly isn’t cheap, but if your budget for a daily work bag is a few hundred dollars, it’s definitely worth considering over a traditional briefcase.